Robin has been keeping bees and harvesting honey for many years. She enjoys being a backyard beekeeper. 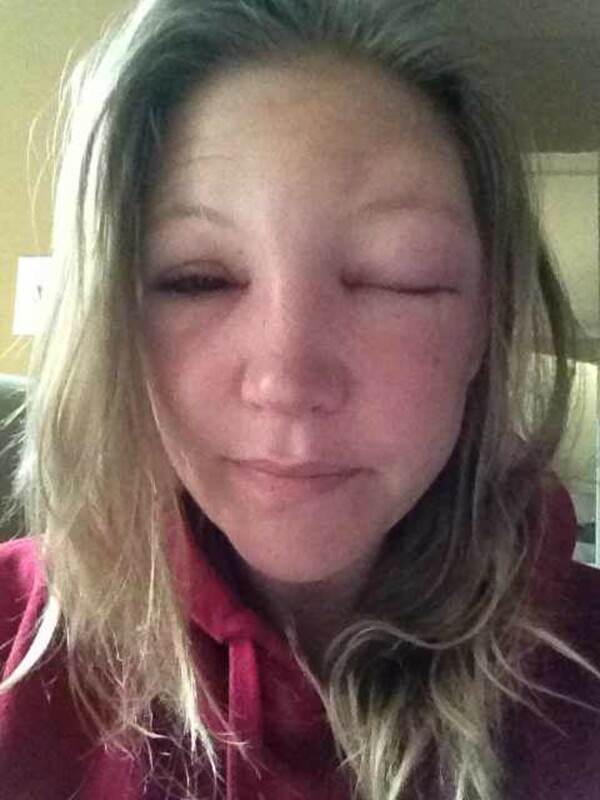 Yes, this is me 24 hours after a bee sting to my eyelid AND this isn't an allergic reaction. Normal Reaction or a Bee Sting Allergy? 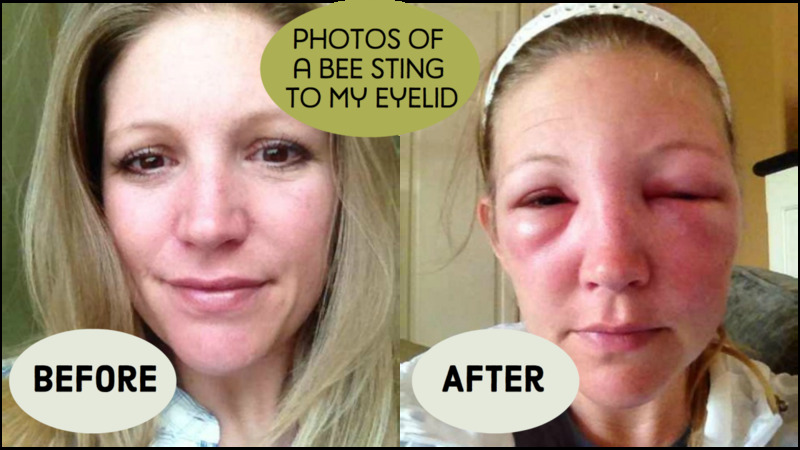 Being stung by a bee can be a very scary occurrence; if you are stung in the eye it can be days before you are back to normal. Being a beekeeper, I expect to be stung; it's part of the job. I didn't, however, expect to be stung in the eye. Information on treatments—both home remedies as well as prescriptions. A photo progression chronicling the recovery of my facial swelling from hours after the sting up to six days when I was almost fully recovered. Information on how long the itching and swelling will last. How to Treat a Non-Allergenic Bee Sting: Act Fast! Being a beekeeper and going through extensive training, you learn how to properly remove bee stingers and treat stings. The sting that I had to my eye however, needed some medical attention. The advice that I give is from my training as a beekeeper and from the doctor that I saw. In most cases, doctor involvement is not needed for non-allergic reactions. However, if you are stung near your eye, you may choose to get prescription medication from your doctor. After a bee stings, a stinger and sac of venom is left behind in your skin. To reduce the amount of venom in your body remove stinger and bag of venom as quickly as possible. You can SCRAPE the stinger and bag of venom out of your skin with a fingernail or other similar object. Do not pull out stinger or squeeze the location as more venom can be released. The longer that you leave in the stinger, the more venom will be left in your body causing swelling and itchiness. Once the stinger is removed, wash area with soap and water and apply antiseptic and soothing cream like hydrocortisone. Apply ice pack to site to reduce swelling and for pain relief. For additional pain relief, you can take an anti-inflammatory like ibuprofen. Famotide (Pepcid) an H2 Histamine blocker. Hydroxyzine (Atarax) treats itching. Blocks natural substance (histamine) that your body makes during an allergic reaction. Causes drowsiness. These treatments are NOT for those that have severe allergic reactions. For severe allergic reactions, epinephrine will need to be injected to stop the progression of symptoms. Severe allergic reactions can result in death within minutes of being stung. Having an Epi-Pen on hand if you are allergic to bees is a must. I had a reaction to the sting that was fairly severe, mainly due to the location of the sting on my eyelid. I, however, did NOT have an allergic reaction to the venom. It is very rare for someone to be allergic to bee venom, however, around 50 people a year die from a severe allergic reaction to a bee sting. Day 1: Benadryl every 8 hours and ice. Day 2: Benadryl in the morning. Was given prescription in the afternoon. Took 10mg of Dexamethasone (Decadron), one tablet of Hydroxyzine, and one tablet of Famotidine. Day 3-6: Hydroxyzine and Famotidine until swelling and itching were gone as prescribed. 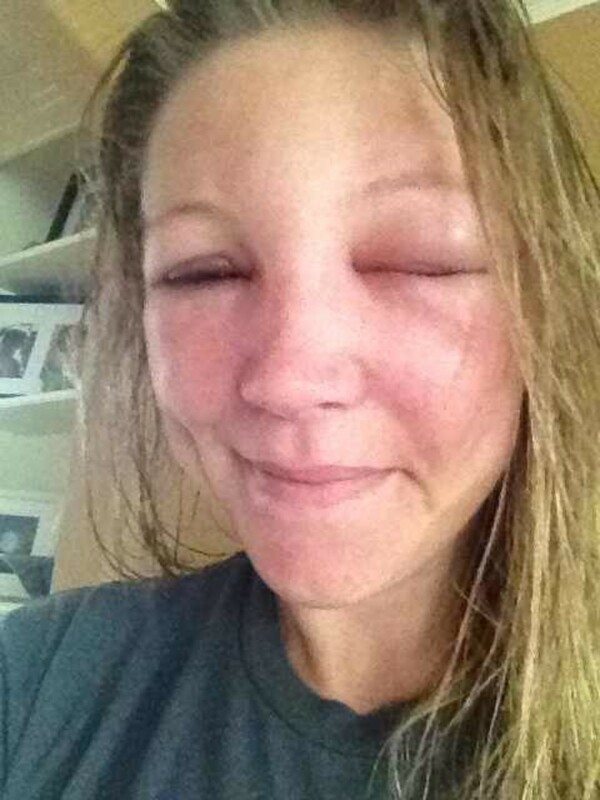 One of the scariest parts of being stung by a bee on your face is the reaction. I chronicled my progression as a guide for those that have been stung. It took about a week for my face to fully recover and there were a few days that were especially bad. If you've been stung, I hope your reaction wasn't as bad, but if it is, you will fully recover. I was stung in the afternoon after going into my hive. I started swelling within an hour. If you've just been stung, make sure you remove the stinger quickly, take Benadryl as soon as possible, and ice the site of the sting. I also suggest calling your doctor to see if she/he will prescribe any of the medicines I recommend above. Eyelid where sting occured is completely closed in the morning. Began prescription medicine. Swelling begins to travel down my face, into my jaw, and across the bridge of my nose. Morning after bee sting to the eyelid. One eye completely closed. This was a scary, almost claustrophobic, feeling. The second day was definitely the worst. One day after bee sting to the eye. Began prescription medication 24 hours after initial sting. Close up of eye one day after sting. I have been taking prescription medicine for one day. Eyelid is open but bruising is more evident. Cheek, jaw, and bridge of nose are puffy. 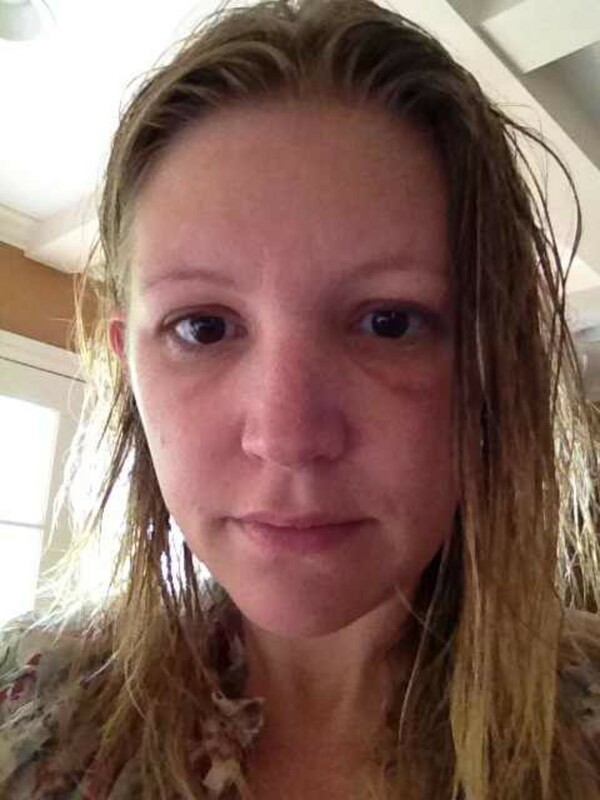 Forty-eight hours after bee sting to the eye. Began prescription medication 12 hours prior. Reaction on the third day. The bruising is more evident in this photo. 48 hours after bee sting to the eye. Began prescription medication the previous day. I finally went out of the house, although I wore sunglasses all day. Feeling a lot better today. Eyelid is almost completely open. Bruising and slight swelling is still evident. Four days after bee sting. There is still some swelling in my jaw, and I still have bruising under the eye. This was actually a difficult day to be seen because I looked like I was in a fight and not stung by a bee. Five Days after bee sting. Eyes are slightly puffy and black and blue underneath. I'm almost back to normal. There's still slight bruising and swelling. Day Six: Eye is still slightly puffy and black underneath. How Long Will the Swelling and Itchiness Last? If you are stung on a sensitive part of your body like the eye or lip, it can take 5 to 7 days for the swelling to be completely gone. If you are stung on another part of your body (a hand, arm, leg, or foot) the swelling should go down in two to three days. However, in most cases you will have itchiness for up to a week. Your treatment of the sting immediately after you were stung. Worker honey bees sting for one reason: to protect the hive or themselves. Honey bees are usually not offensive animals; they sting if they are threatened. Simply letting the bee be, is your best course of action. The bee will eventually fly away, and you will be left without a sting and the bee will be back to its business of collecting nectar and pollinating your flowers. However, if you swat, hit, or step on the bee, it will most likely sting you. It is a natural defense mechanism. Bees are fascinating animals. The hive works as one large superorganism; each bee has a job. Their role in the hive is predetermined by their age and what is occurring in and out of the hive. The bees that sting are either guard bees or forager bees. Bees near a hive sting to protect their home. Away from the hive, most bees will not sting if they land on you. Beekeepers wear protective clothing for this reason. Guard bees protect the hive from intruders, whether they are a skunk or a human. Most beekeepers are not stung when they go in the hive because they take precautions. The two best defenses against bee stings are your protective clothing and smoke. How Does Smoke Prevent Bee Stings? For a beekeeper, having a good smoker is a must. Smoke does two main things: causes bees to consume honey rather than defend the hive and masks alarm pheromones. When a bee smells smoke it goes into survival mode. It is no longer protecting the hive because the hive is on fire. It instead gorges itself on honey to ensure its survival when it is time to fly out of the hive to safety. Smoke will also mask the alarm pheromone that bees emit when they are under attack. When a hive is "under attack" guard bees will raise their abdomen and release an alarm pheromone called isopentyl acetate. This pheromone is also released when a bee stings inciting other bees to follow suit to protect the hive. This alarm pheromone chemical is also found in bananas; this is why stings sometimes smell like bananas and a reason to never bring a banana near a hive or eat one before entering a hive. Honey bees, worker honey bees to be exact, have barbed stingers. 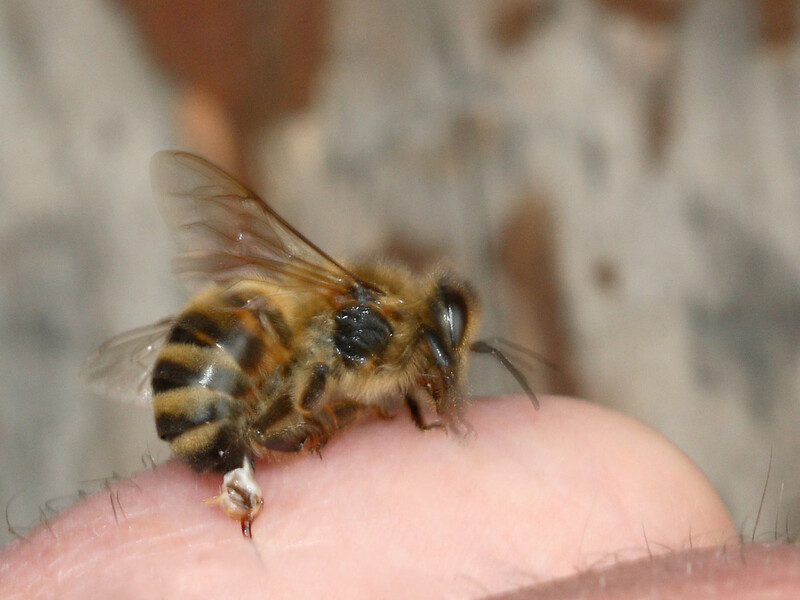 When a bee stings, its stinger is left in your skin as the bee flies away. Unless removed, the barbs in the stinger ensure that the stinger stays in your skin to release venom for the next 30-45 seconds. When the bee flies away, the stinger is ripped from the bees abdomen causing irreparable damage, and the bee will die. Queen honey bees do not have barbed stingers so they will not die after they sting. They rarely leave the hive unless to mate or swarm, so it is incredibly unlikely to be stung by one. A drone bee's (male bee) only purpose is to mate with a Queen. Since they do not defend the hive, they do not have stingers. Drones will leave their hive to inseminate queens in an area called a Drone Congregation Area. They will fly 200 to 300 feet above ground attempting to inseminate a queen. While drone bees do not have stingers, their sexual organ is barbed. If they are one of the "lucky" ones to mate, they quickly die after mating because their sexual organ is left inside the queen and ripped from their body. The next drone to inseminate the queen must remove the last drone's sexual organ to inseminate her further. Queens will mate up to 12 times in their one mating flight from their hive. When I was stung, I had just gone into my hive wearing my beekeeping gear and hood. I was not stung while tending the hive and was fine. Unfortunately, while 10 feet away from my hive, I took off my hood and a bee landed on my eyelid. Had I left the bee alone I probably wouldn't have been stung. Unfortunately, I swiped away at my eye before I thought about what I was doing and was stung in the eyelid. While the sting itself didn't hurt very much, the next few days were a bit uncomfortable. Searching online, I wanted to know what my next few days after being stung in the eye would be like. Would the swelling get worse or better in the next few days? Would both of my eyes close? Would there be pain and itching? When would I be back to normal? Since there wasn't any information, I thought I would chronicle what happened to my eye after I was stung and the mistakes that I made that impeded my recovery. I hope the information provided helped in your recovery! 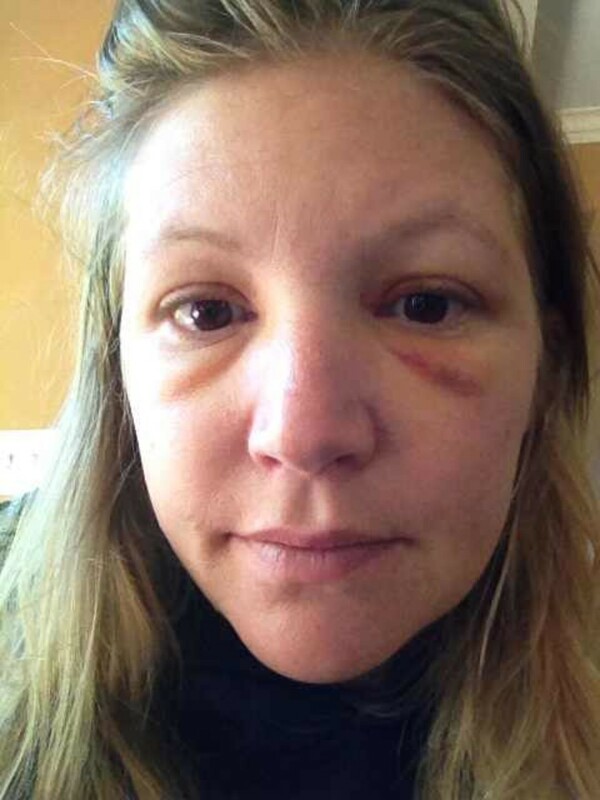 A week after the initial bee sting to the eye, I was completely recovered. While the site of the sting never hurt, it was unnerving not to have the use of one eye for a day, and my equilibrium was off. The closest thing that I can equate it to is claustrophobia. Not being able to open your eye is a troubling feeling. The balance issues could have been due to the medications, but I did not feel completely myself for about six days after the sting. Getting stung is never fun, but if you want to be a beekeeper, there are definite advantages: honey! If you have been stung, please leave your feedback below to help others that are experiencing the effects of a bee sting. Have you ever been stung in the eye by a bee? Is it normal to have hardness around the affected area of a bee sting? Swelling will cause your skin to be tight and hard, and there could also be fluid build-up, but I don't recall feeling that the area was particularly hard. How long does it typically take before the swelling is completely gone when you are stung around the eye? The first few days after the sting are the worst. It can be a few hours before you will notice a lot of swelling, and it can take up to a week before you feel and look back to normal. After the swelling goes down, it is likely that you will have bruising that takes a few days to go away. Even if you were only stung near one eye, you may have swelling and bruising across the bridge of your nose into your other eye. Overall, it can take up to 7 or 8 days for a full recovery. When should I see a doctor if I have been stung on the face? If you are having difficulty breathing, if your mouth feels swollen and you are having a hard time swallowing, or if you are having an abnormal increase in heart rate, call 911. You could be going into anaphylactic shock. Even if you aren't experiencing the above symptoms, you may want to see a doctor for prescription medications that help with swelling. Taking Benadryl will help, but if it's not enough, call your doctor. Always, if you are ever in doubt, call your doctor. What should I do immediately after I am stung on the face? 2. Wash the site of the sting with soap and water. 5. Apply a cold compress. Thanks so much for your post! Was stung last week when husband brought in bees that were trapped in his suit! He was stung five times, but I got the worst in the forehead by my left eye. Figures we were celebrating my daughter's birthday and quickly did a quick fix of removing stinger and applying icepack. 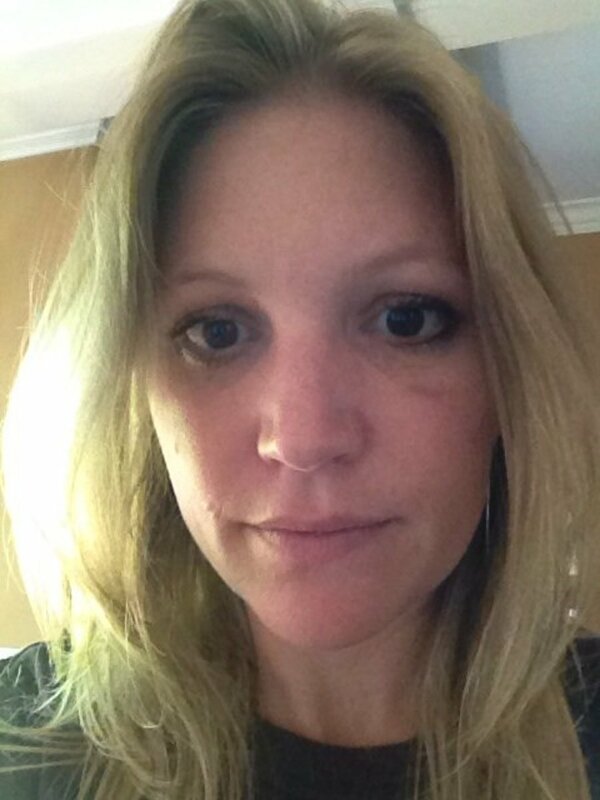 Took benadryl and ibuprofen; however, left eye swelled up fast! If it wasn't for your pictures, I would have freaked out! Thanks for telling about the second day being the worst so I was better prepared! Needless to say, my husband and I have new and better bee suits that will keep out the girls! My 14 yr old son got stung by a wasp right above his right eyebrow! There was a white spot where it stung him amd with in 30 min his face started to swell! I have never dealt with this before so i panicked! My husband got benadryl in him instantly i checked on him every hour and every hour his face swole more and more the day it was moving down his cheeks and so i took him to ER! they gave him an epi shot and more benadryl and with in 30 min he could open his eyes again! Today is day 5 still has some puffiness around his eyes but looking normal again! Ypu post help keep me calm! Thank you again! And for parents i was told by the doctor you wont always have trouble breathing and considering how serious his reaction was they told me next time to go ahead and pop him with the epi pen! 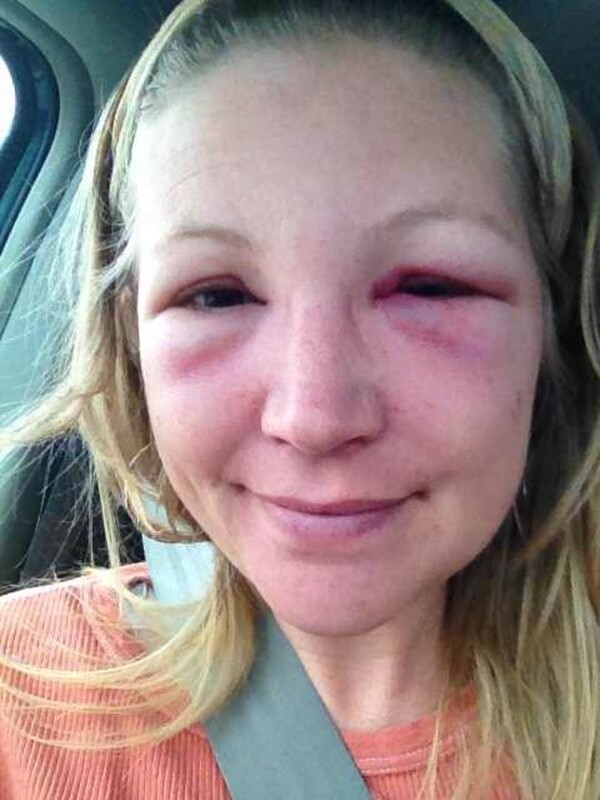 I was stung by a bumble bee last summer onthe face 5 times.I looked just like your pics. It is not fun.Unfortunately i was stung on the forehead 3 days ago.The swelling is starting to go down today.Your post is been helpful and hope it continues help ease peoples pain and swelling.A light at the end the tunnel. Good luck to you, Alicia. It is a scary feeling for mom and daughter, I'm sure! I hope she's better soon, and I'm glad you are going to see your GP. Hi. 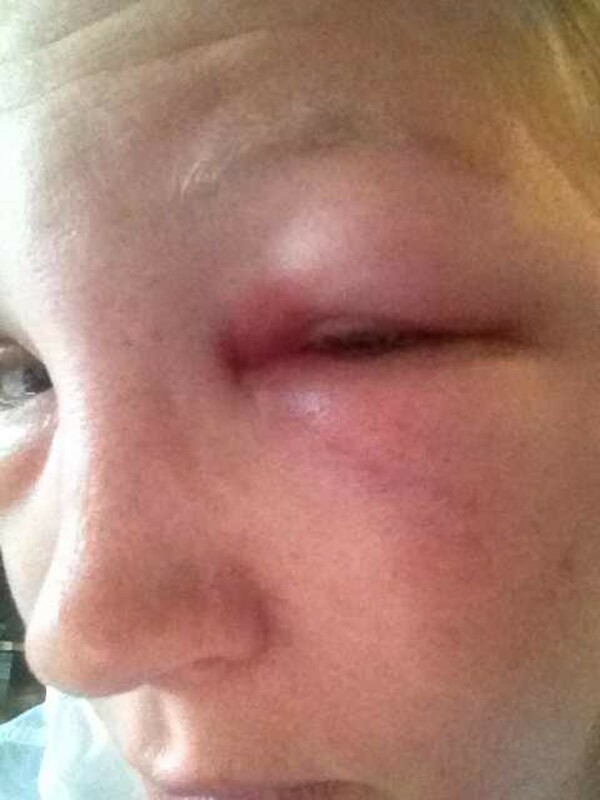 My 7 yo girl was stung at school on her eyelid yesterday. I gave her pain relief and some anti inflammatory and then as the swelling increased I got the dr out. I should have googled before he came so I could ask about it but he advised to continued with what we were giving her but to add an antihistamine to it too. 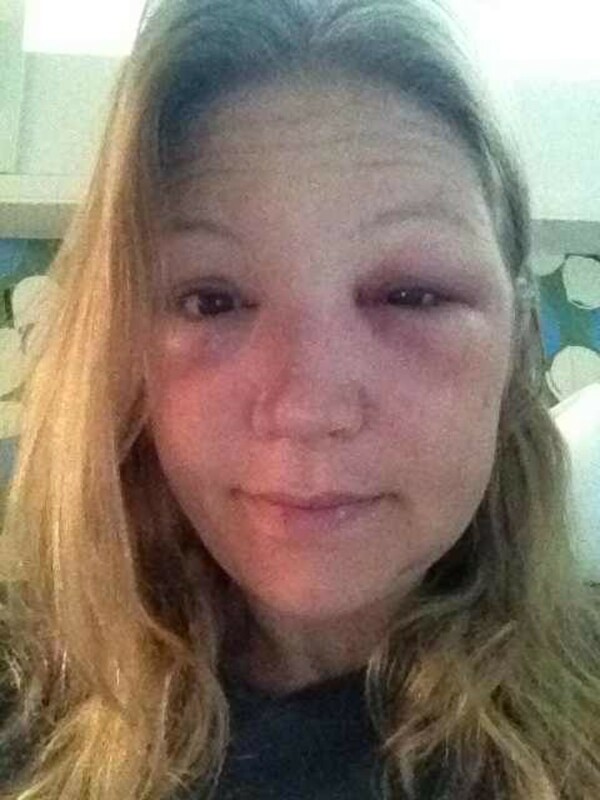 It's about 14hours since the sting and she looks like she's been in a boxing match. At least she's sleeping. Im taking her to our GP in the morning armed with your useful info. Thank you, from a worried mummy. I am not a bee keeper, however thank you for this detailed discription of what happens when you get stung. I am 56 years old and have been stung a few times in my day, I was stung yesterday and I didn’t think much of it I went back to work. My finger swelled up, hurt a little and went back down. Done deal right? Wrong!! I woke up in the middle of the night with the most intense itching, swollen, and hot finger! What? In my old age I was not aware that it could go through different phases, ice pack helps. To late for Benadryl, I have to go to work. Thanks again, you helped me realize that it was a normal reaction! Thank you so much! I got stung on the eyelid yesterday. Thank you!! Best info on the web! While enjoying Fall color in the Rio Grande bosque yesterday, we sat on a log, was a hive. Bees attacked immediately, and pursued us about 20 yards. Pain first day, by 10:00 PM eyelid began swelling, later edema had spread to cheekbones, today swelling isn't quite closing eye. Had some atarax from former prescription & took it. Waiting to see. Should I take benadryl too? Hi Megan. I'm so sorry. It was a scary feeling as an adult to be stung, so I can only imagine how scared a 3 year old feels. Hope she's better soon! Thanks for sharing I was stung yesterday in eye while doing hive inspection. Somehow bee got into my hood. Swollen swollen swollen! Hi Jane, I don't remember feeling numbness other than the feeling you get when you are really swollen, which kind of feels numb. If your swelling is down and you feel numb, you might want to call your doctor—just to be safe. Glad the swelling subsided so quickly! I wasn't so lucky. Did you have any numbness around your eye? I was stung on my eyelid 3 days ago, and most of the swelling is gone, but today noticed my temple and upper cheek felt numb. Nothing worse than having this happen to a child. If he's not feeling better today, you might want to see a doctor for some medications. Hope he's better soon!! My 7 year old was stung twice yesterday, August 25th. Once on his forearm and once on his forehead. His eye is still swollen shut. It's so hard to see my child in this condition. I'm getting him an eye patch today so he can still walk around and not feel like he was in a fight. I'm sorry! Hopefully you will get in to see your doc today! If you look at the treatments table above, you can see all the medications that you can take. Good luck! My son was stung yesterday yesterday by his eye and this morning it's completely swollen shut. Thank you for this post; I don't feel as worried now. It's Sat so his ped is closed til Mon. What prescription did you take? I'm not sure if I should give Benadryl for the swelling. Hi Susan. Thanks for your comment and letting us know what happened to you. I have never heard of localized reactions influencing an allergy. I have been stung many times on my hands after the face sting and have not had any out of the ordinary reactions. I have actually heard that some beekeepers crave the sting and its reaction; it can feel like your systems are kickstarted. 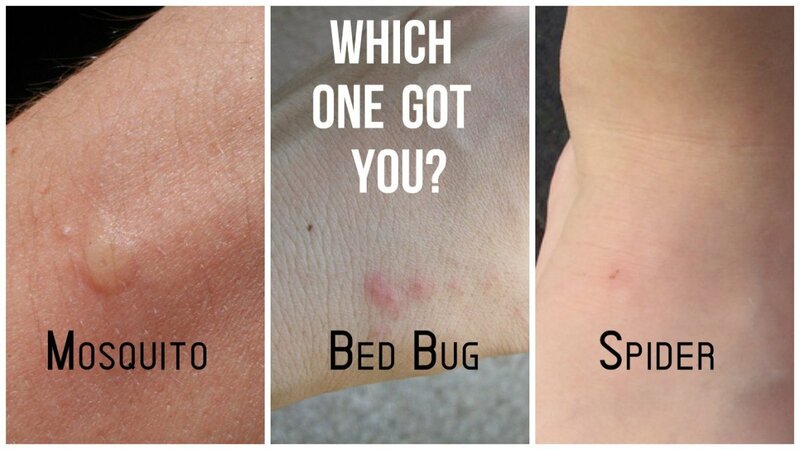 For me, I just itch after a sting on my hands or arms. One of my hives last year was not a happy one and I should have re-queened, but I didn't want to even go near it. :) The hive died off, so my new hive seems so gentle. Thanks again for the comment. Beekeeper here. Thank you so much for this article and your documentation. I was picking flowers near my 3 hives( one is tetchous) and a guard bee came to tell me to go. I held the flowers up near my head and quickly walked away. The bee got caught in the hair of my forehead over my right eye. I tried very hard not to do anything. After I was 150 yards from the hive I no longer felt the bee although I never heard it fly away. I took my hand and brushed it through my hair ~almost reflexively and boom, stung in hairline on forehead. Poor bee. I went in the house and took out the stinger and immediately took 2 benedryl. One can see why you swell so much in the face. There is only bone and skin and nerves there. I immediately iced but swelling traveled down on the next day to eyes and under my eye lids and my right cheek. Today is the end of day three. I still have a baggy eye that waters but I think it is going to slowly improve. I am going to print this article and take to my MD. Possibly I can get a Rx of steroids and Pepsid for an emergency. I do have an epipen. Your documentation is excellent and you are helping so many people understand this. Do you think that people with localized reactions are more prone to becoming allergic? Thanks for the post; I was a little freaked out until I read through this and it put my mind at ease. Thanks, Wendy, and I'm glad you're on the mend! It's a scary few days. Thank you so much for posting this detailed report of your own experience. I was stung on my eyelid while riding my bike on 7/29/2017 and immediately Googled when I got home. Your story and pictures put me at ease knowing what may come. The stung eye and cheek on same side of face swelled quite a bit like yours but fortunately I had only very minor swelling in the other eye. I took a few Benadryl in the first couple of days and also used ice pack. By Day 4 (today) swelling is starting to dissipate but eyelid is still quite red. Again, I so appreciate your post! Thanks very helpful. Stung yesterday just wanted to know what was normal. Lucky because only one eye is swollen. Thank you for your detailed post. It reassured me that all would be well, given time. I was stung on the eye lid on Friday afternoon. Things didn't look too bad until I woke up with swelling matching your own pics on Saturday morning. I dutifully took myself to the DR who prescribed a cortisone cream and antihistamine. It is now Sunday evening, I can open my eye again, although redness and itchiness persist in the area affected. Ice pack and cold black tea bag on the eye also helped to alleviate irritation. My son my son got stung by a wasp near his eye yesterday evening so your information makes me feel better about his swelling. Hi Carol. Sorry to hear about the sting. The lemon water/ginger/green tea is an interesting concoction. How did you come up with that and what are its benefits? Thank you for this! I'm currently on Day 3. Progressing just as you did. I have taken ibuprofen, benadryl at night and flushing my system with lemon water/ginger/green tea variations every 30-60 minutes. Plus the ice packs of course. Having bees is still worth it. Did as you suggested aks second time have been stung near eye after tending bees, this time got stuck in my hair as I returned to house and tried to comb out and stung me on cheek by eye. Ouch. Took anti histamine and immediately turned bright red and rushing noise in ears. Reacted to hystamines sadly so on my way to GP. Icing face as typing. The late reaction to the sting is so interesting, Marshall. I was stung yesterday on my thumb while tending my hive and the swelling peaked a few hours later. Ice on the area really helps relieve the symptoms. I hope you are better soon! Thanks for your post. Very well documented! I found your post after being stung in the temple just inside the hair line. My eye didn't swell until two days later & mostly under the eye! The worst eye bag ever! It's too late for medical intervention but I am going to try the others. Thanks again! Sorry to hear that, Embrey! Hopefully you can rest this weekend. The itching is horrible, I agree. Ice or a cold washcloth on the eyebrow can help with that. Good luck. I was stung on my brow bone area and am going thru the same thing. I am on day 2- the worst it seems with extreme itching and swelling; and it is a holiday weekend. Sunglasses and Benadryl, are part of my routine for the next 4 days. Hi Tom! Hopefully it never happens again! It's only happened to me once in the 5 years I've been keeping bees. All of the other stings I have experienced are very mild in comparison! Good luck with your three hives. @Rose - yes, when something like this happens, you definitely realize how precious our eye sight and health is! I hope you feel better soon. It's not a fun couple of days. THANK YOU for taking the time to compose this article! I was stung by a honey bee yesterday, about 50 feet from our hives, in my hairline above right eye. She got caught in my hair as I was getting in the car. I should have immediately looked in a mirror, I might have been able to help her get out, without stinging. I scraped at the spot, but probably didn't get the stinger out. Today my eye is nearly swollen shut, and my forehead is clearly buldging on that side. (I did not take Benedryl or use B. spray, because it gives me restless legs.) But last year I was stung under an eye, and it was like botox, that undereye was warm and pink and not wrinkled or baggy for a month! Did you ever notice that we don't appreciate our healthy days as we should? So grateful for your chronicle. 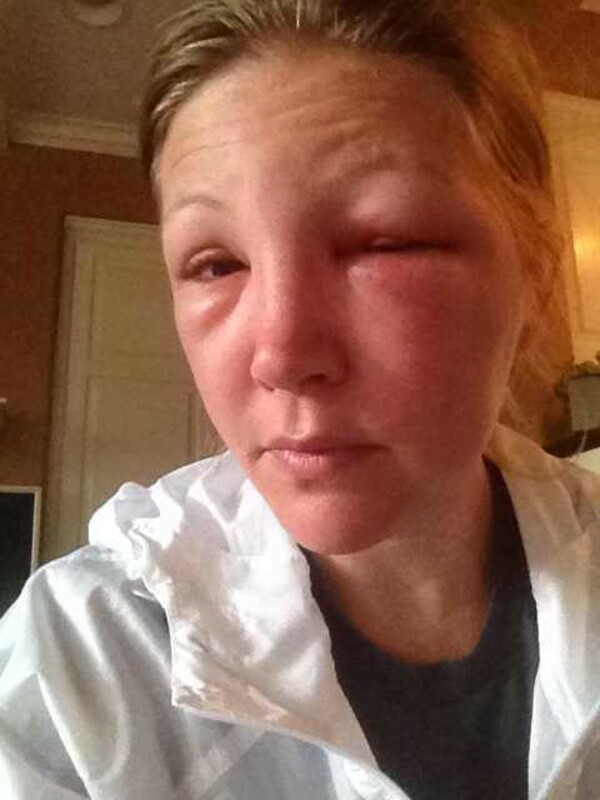 I, too, am a beekeeper, and was stung on top of the head Friday morning before work. It took me about 5 minutes to find the stinger and remove it, and except for some some flushing and heat in my face, I was fine and went to school. My athletes had a big track meet that day so I had to travel, and by around 4, though my forehead had been swollen and itchy, my left eyelid was swelling. Long story short, woke up yesterday and my eyes were both swollen: eyelids, underneath, bridge of my nose -- boxer style. Today is day 3 and my left eye is closing. Started thinking I might need to see if there was anything I could find out about this online. I previously had a sting on the side of my nose, near the corner of my eye, after a bee got caught under my glasses after I took my protective hood off. No reaction other than soreness then. So grateful to see your chronology of the experience. Now I know, this too shall pass, and how to best treat. Thank you. @sharon: I'm sorry you had to be out and about after the sting. Luckily, I was able to stay in the house. I was frightening to look at! I hope it's better today, since your comment was two days ago. @ Fionna: Nothing worse than a bee in your hive suit. It is amazing how the sting and the antihistamine affects how you feel. I also felt strange all day. I hope you're on the mend! 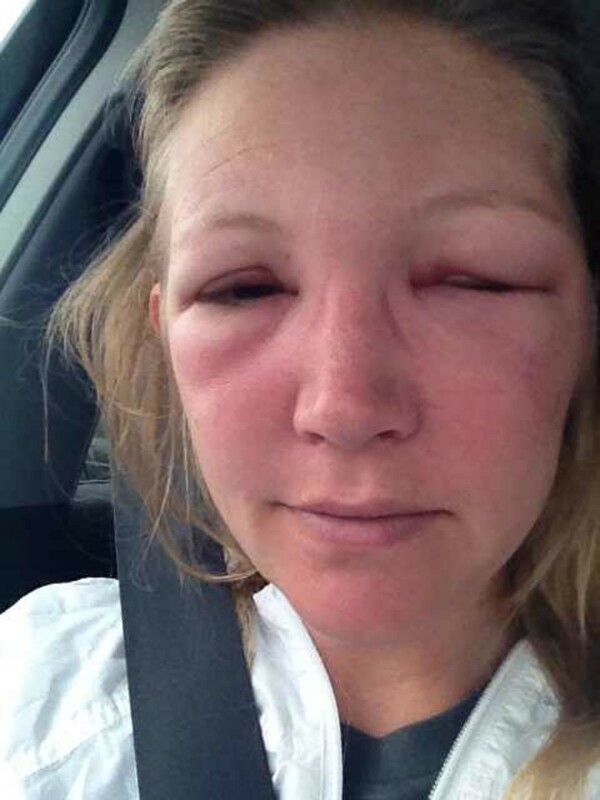 @Kelly: It's interesting how the sting on the top of your head also caused your eye to swell. Thanks for sharing your story. Hope you're feeling better! Great to see our post. I was stung on my head, Saturday afternoon. I woke up Sunday to a little bit of swelling on my forehead. By the end of Sunday, my right eye was starting too swell and the side of my face. I wake Monday morning to a complety shut right eye. Good to see my reaction is not going to last forever, I am flying out on a holiday in 6 days. Sorry if there are errors, typing a little challenging with one eye. Thanks for this. I feel better that mine is a normal reaction after reading it. I got stung at the hive area just under my eye yesterday when Bees managed to get inside my suit! (My sloppy dressing)! I couldn't take the suit off or get to the stinger for some time so it was left in! Once suit was off and stinger out I took an anti histamine and Ibuprofen and applied ice. It was quite painful to be honest. The rest of the day I did feel weird but eye looked ok. This morning however it is very swollen and painful. I've taken more medication and applied ice. I was just googling to see if there was any information on how long this might last! Didn't expect 6 days of this!! So thanks again...now I know! Thanks for this post. Yesterday I was stung on the end of my nose through my bee suit. I could not stop and get the stinger out so it was in for at least 15 min. I could see the stinger in my nose while I was working. My plight it much like yours, my left eye and face have swollen and my right eye has mild swelling. Unfortunately, I had to go out today as I am a Potter and had a sale today and HAD to go. LOL Lots of looks. 1 April and I am out with a bee sting face can not tell you how many people thought I was kidding. This is really no JOKE. It feels like the numbness wearing off from the dentist all the time. Terrible. I was checking to make sure this was normal... Well your post answered that question along with your photos . Very helpful, mentally I feel better... physically I am a puffy mess. Good luck over the next few days, Jack. It's not a fun week, but you will feel better! I got stung high on the bridge of my nose 26th February 2017. Right eye nearest the site has swollen exactly like yours. Great puffy sack beneath the eye extending down to the cheek bone. Thank you for the advice, very useful and reassuring. I'm glad you went to emergency, Lucy. Multiple stings can be very dangerous and I recommend that anyone that gets more than a few stings and are feeling the symptoms you were feeling go straight to emergency or call 911. It's rare, but people can die from bee stings. Once bees and wasps start stinging they leave a pheromone that triggers the other bees to follow suit. I hope you were given medication that will help in your recovery. Rest up and hire someone to get rid of that wasp nest! Thank you very much for your article. It is helping me to deal with my wasps attack drama. Several days ago, I was stung repeatedly (nose, right eye and left arm) in my garden where the wasps made their nest. How fast and vicious they were! I'm not allergic to anything, however, due to the venom overload, I had a bad reaction( sharp pain in my face and neck, sweating, lethargy) and had to go to the emergency. I'm recovering now and I hope to see myself normal again and of course to hear endless jokes about me "welcoming" wasps into our garden and running faster than an Olympic sprinter. Thanks again. Hope you're on the mend, Triagirl! It is odd that it took so long to start to swell. Thanks for sharing that information with us. Good luck to you! I just got stung by a bee 2 days ago as I was riding my bike. I was going downhill very fast as it happened. The bee stung me and then got stuck behind my sunglasses! I couldn't remove it, it hurt so bad! First 12 hours nothing happened then all of a sudden my left eye totally swelled up and I started getting headache, I felt really bad. My heart rate was going up and down the whole day even though I was just at home taking it easy. I guess that's the chemistry of the bees, their stings are just venomous. I'm happy I saw your post, I now know that I just need some more days of patience. Thanks a lot! Thanks for your comment, Melissa. I'm surprised that a sting on the top of the head would cause a similar reaction to your eyes. Wow. Hope you are feeling better soon! Hi!! I was actually stung right on the top of my head but I am still looking like you!! Both eyes are 3/4 closed, very puffy under and around eyes. It feels like my forehead has been botoxed!! I was stung 29 hours ago. I am a beekeeper also and have been stung before. This is the worst reaction by far. And all this from the top of my head. Not even on my face!! Was useful to see your photos. Makes me feel I am not alone. Struggling to keep my eyes open!! Wonderful to see your post. I was stung on the eyebrow yesterday - gardening in the vicinity of our backyard hive. I now realise my swollen shut eye is moderate - no swelling across bridge of nose etc - just woke up on Day 2 and thought I would find out more! Minimal itch or pain fortunately. My husband and his bee keeper partner were both attacked while attending to the hive a year or 2 ago when they were not totally kitted out - exposed ankles and hands. My husband's initial swelling on the hand was intense ballooning up his arm and at midnight about 6 hours later on a Saturday we decided to seek medical help - didn't want to go to bed and have him possibly not wake up! He had an injection at the medical centre - can't remember what now but his recovery was so fast and itch free compared to our friend who did not have such an intense reaction but soldiered on with non prescription medication and incredible itch and misery. Did you feel like you had been punched in the eye? My sting in on my eyelid and the entire eye socket hurts so bad. Thanks for sharing your experience! I am on day 4 and similar expereince to yours! Thanks for posting. I got stung at the outer end of my eyebrow today while doing a OAV treatment. Didn't have my veil on because the reespirator interferred with it and was a nuisance. Plus it was cool out and the bees were quiet until I stuck the darn vaporizer in the entrance. I tend to swell pretty bad, but my doctor wasn't in today and the other dr in her practice wouldn't give me an rx, plus I am allergic to ibuprofen, etc. so just benadryl and cold compresses for me. Seeing your progression gives me a good idea of what to expect. 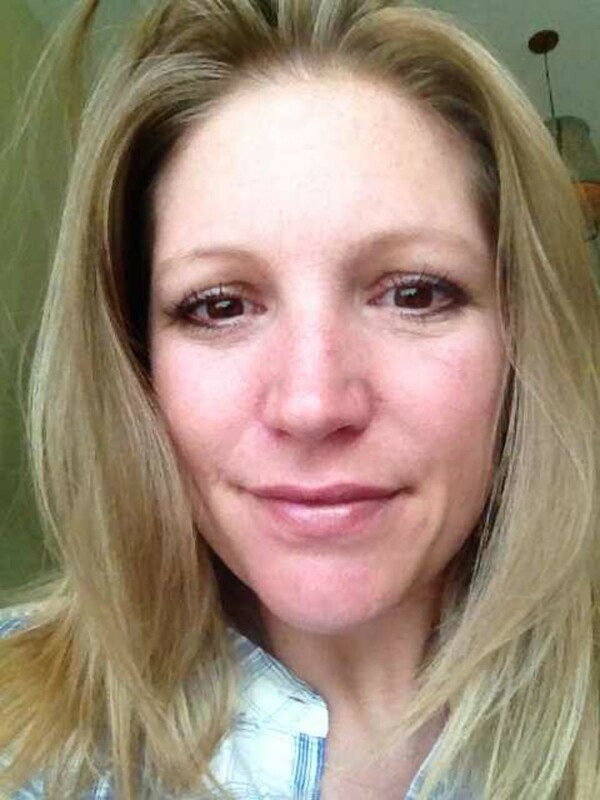 TaniaMarie, thanks for giving us the full account of your recovery and treatment. It's super helpful to other readers! I remember that feeling of pressure at the point of my tear duct—super uncomfortable. I'm glad you went and saw the doctor and started meds. It does help the recovery time. Hope you are better!! Hi Carolyn. 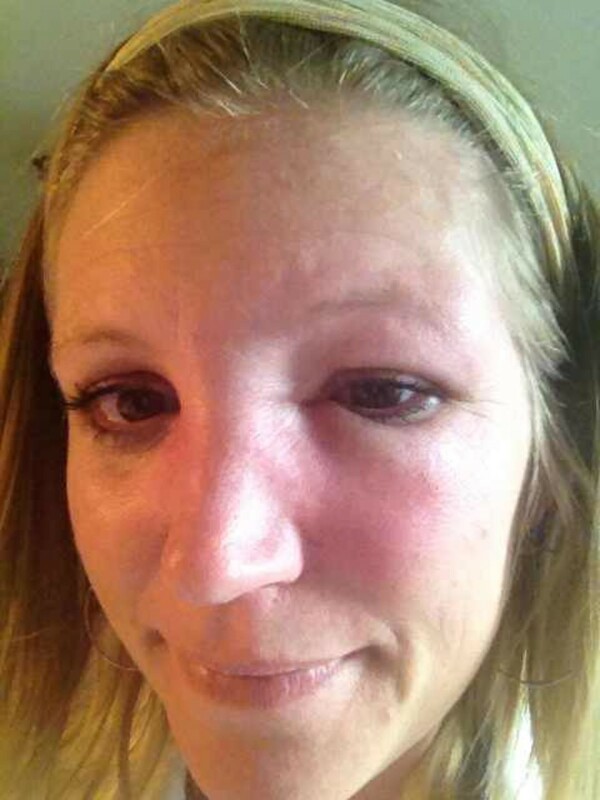 Isn't it interesting how an eyelid sting can be so different than one on the cheek or other part of the face. Thanks for sharing your experience. Everytime I go in thinking it's going to be quick, I don't need a suit, I get stung. I hope you're on the mend! Thank you for writing this. It was the most helpful article I found after being stung. 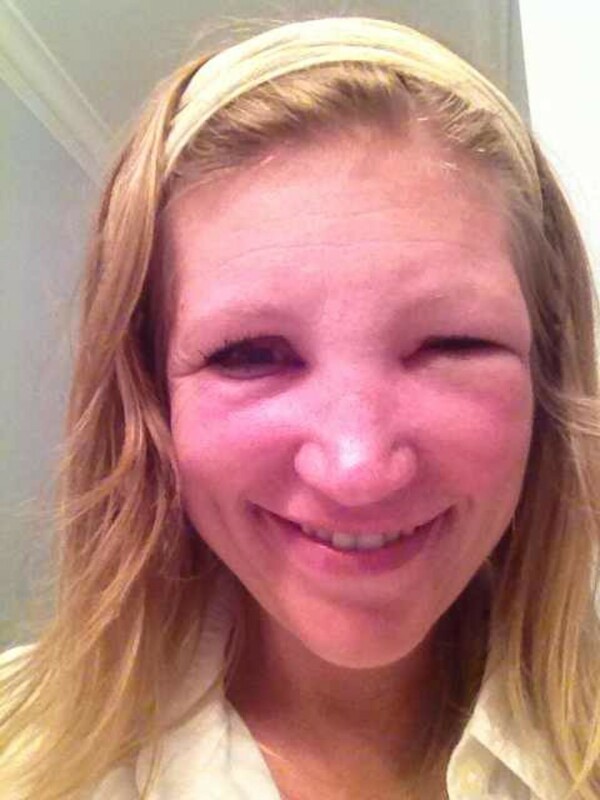 I was stung by a yellowjacket about a cm above the arch of my eyebrow after my daughter accidentally dug into a nest. I was at a park but treated it with a bite stick and ice until we got home a half hour later. I cleaned it, applied a therapik gun, swabbed it with lavender oil & iced it. I was hopeful the reaction would just be a welt but I was woken up in the night by pain & swelling around that eye. By morning my eye looked like your picture within a few hours of your sting with little pain but losts of itching and discomfort from swelling. Later that day It was continuing to swell in the triangular area bounded by the tip of my eyebrow & down and to the side of my nose. The worst area was surrounding my inner tearduct next to my nose. Urgent care doc said it was a normal reaction that follows the lymphatic drainage of the face. He gave me 10mg prednisone to take 2x daily for 5 days and told me to take 50mg benadryl at bedtime. The swelling halved within hours of starting the steroid but it is still present on day 2, and the swelling seems to be more evenly distributed around the eye socket. Dr. said that the swelling should be minimal within 48 hrs and mostly gone by 36 hrs or return for additional tx. My 6yo daughter was stung on the hand and shoulder and I gave the same initial treatment - by the end of the day not a mark on her and no discomfort, thankfully. Thank you for giving a place to share info! Hi Robin, thanks for this post and your photos. 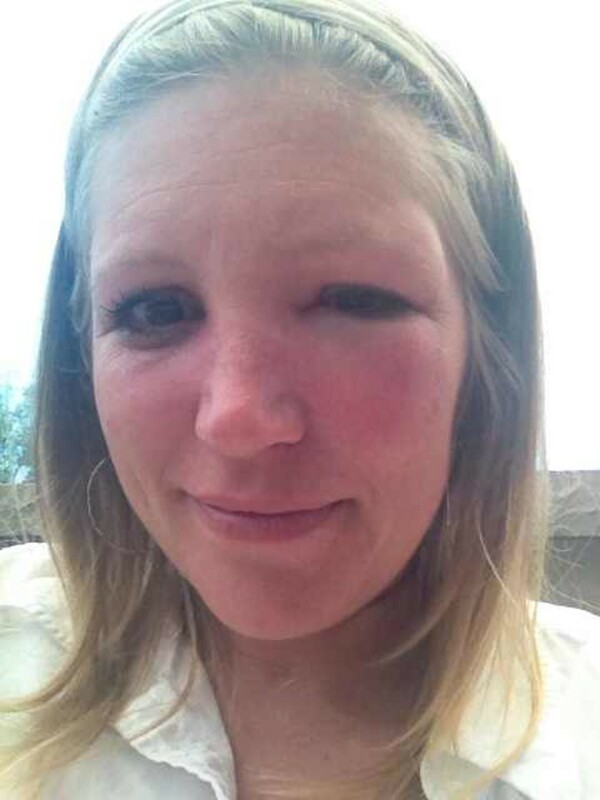 Last year I got stung on the cheek bone by an angry bee about 1.5 hours after we had been in her hive. I had little, almost no, reaction. Yesterday morning I got stung on my eyebrow by a guard bee while doing a quick job (no suit required, or so I thought!) and my face looks very like yours! It is good to see what to expect, thanks! Also, I will add icing to my regime of meds, which I was already doing. Thanks! Hi Bob. I'm so sorry! Yellow jacket bites can also be incredibly painful and can also cause swelling. 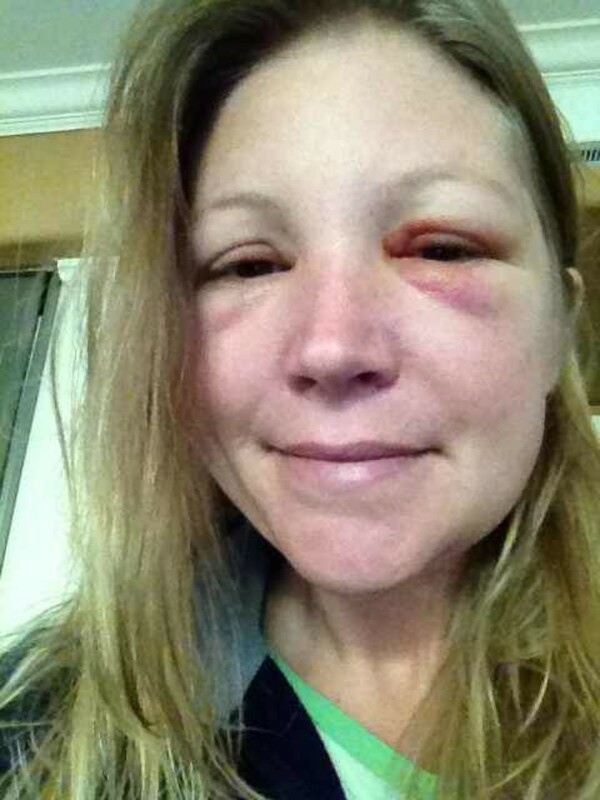 Thanks for your account of what happened and let us know if you follow a similar path that I did with the swelling. Good luck! Hi Robin, I was using electric hedge trimmers to cut away some weeds in the grass, and upset a nest of yellow jackets. One got in between my eye and my safety glasses, and before I could remove the glasses, stung me on the right eyebrow. Since it didn't really 'sting', I just put a little calamine lotion on it and went back outside to my yard work. About 3 hours later, while having lunch, my wife remarked that my eye looked swollen, and sure enough it was! That was 2 hours ago, and since my eye really swelled up, I found this site and took some Benadryl and put ice on it. It's uncomfortable and annoying, and I look awful, but it's not that bad - I did drive a few miles to run an errand, and am glad I don't have to be back to work for 2 days! Thanks so much for your article and photos - now I know what I have to look forward to! I'm so sorry to hear that, Nan. I'm sure it's really painful. It sounds like you hit a wasp or yellow-jacket nest in the ground. Bees don't build their hives in the ground. The treatment and effect can be the same as bee stings though. I hope you're feeling better soon! Thanks so much for this site. I was gardening two days ago and pulled a nest out of the ground, instigating an immediate, furious reaction. I have 9 or 10 stings all over, including my eyelid. I delayed taking Benadryl since I needed to know if it would interfere with my Parkinson's medication, but I did put Benadryl cream on all the stings but the eye. Medics came and we determined my reaction was not allergic (life-threatening), but painful. My face looks just like your photos. This will pass. There's nothing worse than a bee in your veil. I'm sorry you're face is swelling. Getting the stinger out quickly is so important, but when it happens it's natural to be flustered and not be quick about it. I'm glad you had Bendadryl on hand. Good luck to you! Thank you for your article Robin. Hi Alicia, I'm so sorry to hear about your granddaughter. It's a scary feeling as an adult, so I'm sure it's terrifying for a child. She will probably be afraid of bees for quite a while. You may need to do some reading about bees with her so she doesn't have a fear for a long time. Our daughter is still afraid of bees because of my sting. It's a natural reaction. However, bees don't want to sting you and in most cases are docile creatures just trying to do their job of finding nectar and pollen. Let us know how she is and tell her I understand how much it hurts but it will get better soon. Thanks for posting this! My 6 yr old granddaughter was stung at the eyebrow and I was really concerned with the swelling. Reading this, and seeing your pictures, has been a great resource and help. I've been able to show her your pictures and we've been able to manage expectations for healing. @ken—being stung multiple times around the face sounds scary. I would recommend seeing a doctor if this happens and getting on medication. I hope you were able to do this and are better now. @linda—Rhubarb juice is a great tip for reducing itching. It's interesting how some stings can cause more pain and swelling than others. Getting the stinger out quickly is usually one of the best things you can do to reduce the symptoms. Thanks for sharing your experience. 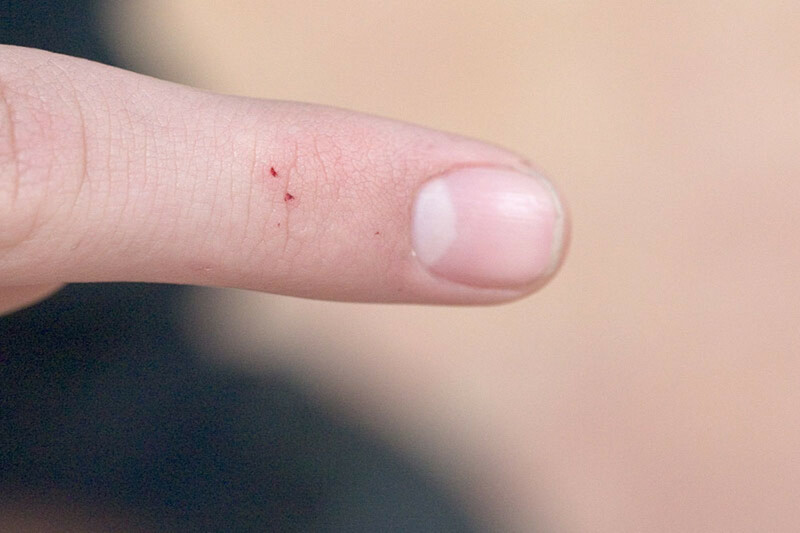 A bee snuck inside with me after sorting the hive, and managed to get me right on my thumb. Because of breastfeeding I tried to hold off on anything other than ice as long as I could, but boy do I regret that now! My hand swelled so much with discolouration right down to the elbow. Urgh! Rhubarb juice has been fantastic for getting rid of the itches but this is definitely the worst response to a sting I've had. Looking forward to getting my hand back again hopefully soon! Was stung between eye and eyebrow and a few times on my ear and head by bees. my eye keeps swelling at night even 6 days later, but goes down after I get up. My lymp nodes under my ears were swelling and actually painful around day 4, but they have gotten better. Just waiting for my left eye to stop swelling at night. Hi Kathy, I'm glad you went to the doctor. The next few days aren't fun, but you will be okay. I hope your hive is a calm one. Last year we had two hives that were too aggressive. They died off, but this year our bees are so calm. The difference of a good queen! Good luck to you!! Thank you. We are new to beekeeping. I watched my husband check the hives from what I thought was a safe distance. Unfortunately a kamikaze honeybee headed straight for my eyebrow. It looks like my experience is paralleling yours. I appreciate the pictures so I know what to expect. I did go to the doctor 24 hours after the sting and she put me on steroids. I'm a little past day 2 now but still have a long way to go before I am ready to go out in public! The worst part is that I wear glasses and my eye is still so swollen that I have to wear them lopsided. Learned our lesson, we won't be touching a hive without full gear and smoke. This article and all the comments gave me a lot of comfort. I was adjusting the lid to my hive - I noticed it was tilted. I was literally there a second before a bee kamakizied toward my right eyebrow. 5 hours later I my whole eyes is swollen and the bridge of my nose is as well. I took benedryl and have kept up on aloe and such. Today is a bit worse - day two - and I know what you mean by he feeling of claustrophobia! However this has taught me a huge lesson in beekeeping, I will not stop keeping those cute little nuggets! I'm glad you are taking meds, Patrick. It's a scary feeling when your face swells. I hope you have a speedy recovery! I'll add my thanks to everyone else's. Very comforting to see the pictures. I got stung much like Greg the mountain biker. I was road biking and the bee was caught between my eye and my sunglasses at about 2 pm on Monday, I had mild swelling by Tuesday morning..Bit by Tuesday midday I looked like your photos. I think it is still swelling some. Fingers crossed it will start to go down s.
Thanks for this post! I had an almost opposite reaction. I was stung around 4 pm on a Thursday, iced and took benedryll. That night and the next day had little swelling but just a red top lid. It wasn't till Saturday morning till it started to swell around my eye and nose. It is now Sunday and it is a little more swollen than it was yesterday, but my eye is still open and I am still taking benedryll. I am hoping for day 5 the swelling is down, like yours. Thanks for sharing! Thanks for this post, I got stung in the bottom eyelid and looked just like you. I went to the doctor and got some meds and am getting better. So sorry, Kristen! It is not fun, but it's temporary. Thanks for letting us know that a wasp sting can have a similar reaction. Good luck with the recovery! wow! Thanks for posting that. I got stung in the same place on my eyelid as you did by a red wasp 2 days ago. Luckily all my swelling stayed on one side. But the pain... not fun. Swelling has mostly gone down. Still hurts around the whole eye when I touch it. Have headache specifically at my temple. Eyelid still droopy. So glad I came across your post! I was stung yesterday while out hiking just under my left eye. Being on top of the mountain I wasn't able to start meds until a few hours later. Weird thing is last night it didn't look bad at all but this morning when I woke was a whole other story. My eye is barely open right now & the swelling has spread out across my nose etc. Going to run to doc in morning maybe they can give something to shorten this experience. But reading your post calmed my panic! Thank you! Thanks for posting this. Today is day 3 and my forehead/eyes are completely swollen today. Your pictures put me at ease. 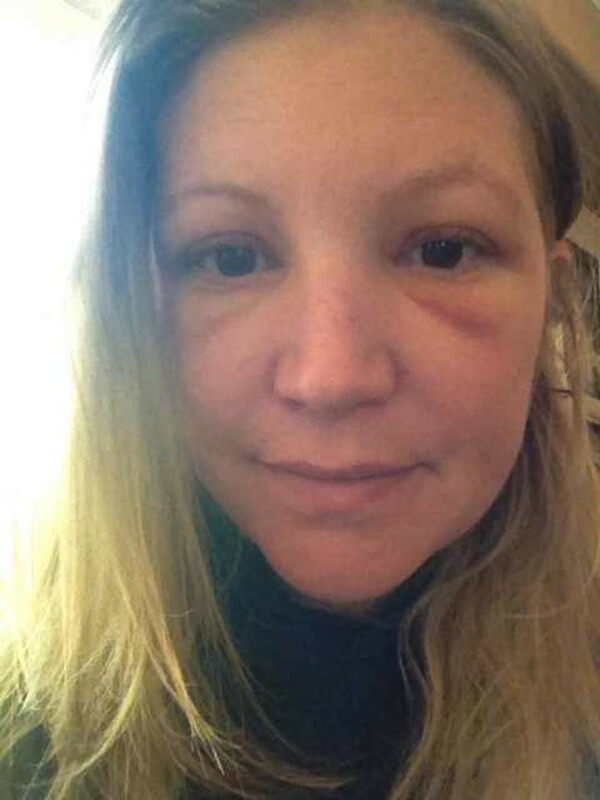 I was stung on the nose and while things did not look too bad for first 24 hours, I was shocked the next morning when the swelling had spread to my upper lip, cheeks and eyes. Seeing your pics calmed be me down though, so thank you for very informative post! Thank you for this! Very helpful as my daughter was stung under the eye yesterday. Hi Sydney. 300 Hives! Wow! I'm glad the article helped you. Even for beekeepers, it's alarming to have such a reaction. Take care and thanks for commenting. Hi! I'm 19 and have been a beekeeper for a couple years in Alaska. We have over 300 hives so of course I've been stung. Usually the hand or thigh. Not much swelling though. I got stung on the eyelid and under my eye yesterday and I look exactly like you did! It's comforting to know it won't last too long. I know places like your hand had extra layer of skin so it doesn't swell or hurt as badly but the eyelid is one of the worse places to get stung! I've been wearing my judge sunglasses to hide it lol. Thanks!